This article explains how to resolve the issue that causes some documents to be invisible in Librarian. In Librarian, some users may not be able to see all of the documents. This is due to security settings. The settings are managed via the BarTender Administration Console (or Security Console in older versions). 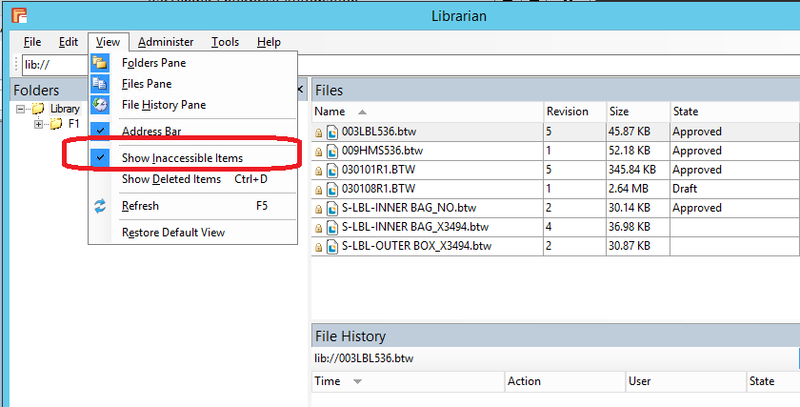 In some case, users will have legitimate needs to view the list of files in the Librarian even if he/she does not have file access. One example is to change the document status. Document control or a QA department may have the need to approve a label, but not to be allowed to edit them. The security settings will make the files inaccessible to Document Control. However they will need to see the file in order to change the status.